Is chronic pain your teacher? After years of working in plant nurseries, vintage book stores, moving boxes of books and digging gardens everywhere I go, I periodically have lower back pain. When in the grips of it, it feels like eternity, but eventually it lessens. Certain chairs or car seats aggravate it, especially after lifting something heavy, or carrying around my bag of books. I know the lower back pain is telling me something. It’s my teacher, and it’s saying: “You don’t need to carry such a heavy burden. Lighten your load. Make more trips. What’s your hurry? What are you trying to prove? Relax.” My lower back pain is also teaching me to do Tai Chi, to be conscious of my posture, to walk my dog with a great awareness of my body, to wear good shoes, drink water and appreciate when I feel pain-less or pain-free, or just simply feel good. I don’t take pain killers for my back, neither over the counter, nor herbal, nor the kind allowed in California, for that matter. I mostly concentrate on lifestyle actions, positive thoughts, breathing, and drinking nervine-adaptogen tea, which helps soothe my nerves and lessen the stress contributing to muscle tension and spasms. Massages and Epsom salt bath soaks can also help quite a bit. I enjoyed an article from AARP magazine, which looks at holistic treatments for chronic pain, especially Complex Regional Pain Syndrome (CRPS), also called Reflex Sympathetic Dystrophy Syndrome and Causalgia. I suggest you read the AARP article. It’s written by someone who developed Complex Regional Pain Syndrome and healed herself. CRPS is constant, unremitting, severe pain that worsens instead of improves over time. It can occur after an injury that didn’t heal correctly. Many people living with CRPS experience a significant loss in their quality of life primarily because of the pain, though also because frequently the only treatment suggested for CRPS is pain killers, which are addictive, and for a pain that is constant and unremitting, they are life-robbing. But what else is there? Some people experience spontaneous remission from the pain. This phenomenon is worth looking into further. Meditation and mindful movements, such as Tai Chi, Qi Gong, yoga, Feldenkrais, and the Alexander Technique can help significantly, and perhaps change the sympathetic nervous system which is responsible for developing the inappropriate pain response to a past injury. Even though the chronic pain can be unbearable, it can also be a teacher. Listen to it. What is it telling you to pay attention to? Are you ready to be the student? PDF of the AARP article is linked with permission from AARP. Passiflora lutea, yellow passionflower vine. Native to the U.S. While walking my dog in Athens, I saw, rambling close to the sidewalk, the leaves of the native yellow passionflower vine, Passiflora lutea. I had never noticed it in Athens before, which made me wonder if it’s uncommon or just inconspicuous. It’s both. And it’s a coveted native plant for wildflower enthusiasts, and commercially hard to find. Passiflora lutea’s shallowly-lobed leaves could easily be mistaken for baby kudzu, which might cause someone to yank it out of their yard, understandably so. The flower is greenish-yellow, an inch or less in size, and slightly covered by the leaves, making them difficult to notice, and perhaps to appreciate, as well. Those who notice will see a precious, intricate little flower, and long, spiraling tendrils. 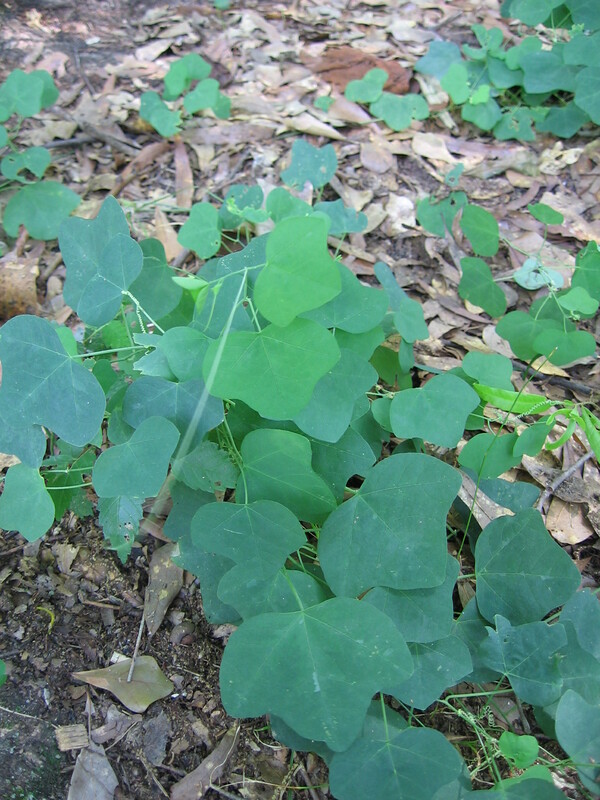 The leaves sometimes have subtle variegation, which is quite attractive. Passiflora lutea, yellow passionflower vine foliage. 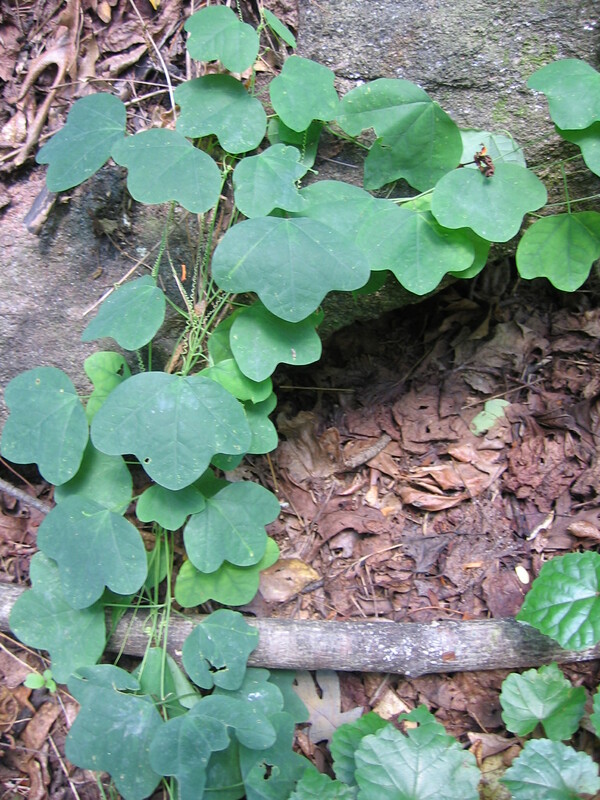 The shallowly-lobed leaves resemble the dreaded kudzu and English ivy. 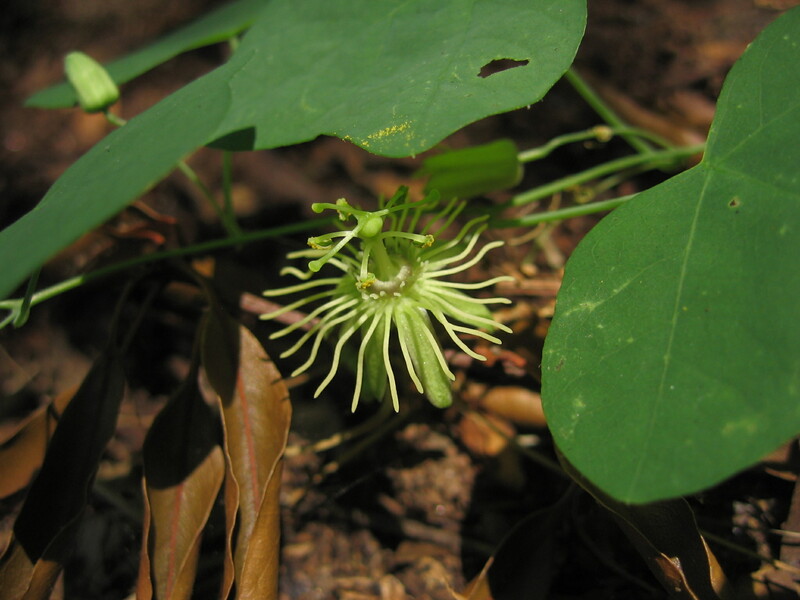 I first saw Passiflora lutea in abundance along a trail on the South Carolina side of the Chattooga River. Since then, I saw it growing at Autry Mill Park in Johns Creek, GA (formerly Alpharetta), and now I’m seeing it in Athens. In each of these places, P. lutea was growing in the shade. I looked at the USDA Plant Database distribution map, which shows its distribution from Texas, Oklahoma and Kansas east, and from Florida to Pennsylvania. These are also the states to which the plant is native, so clearly it hasn’t spread much. 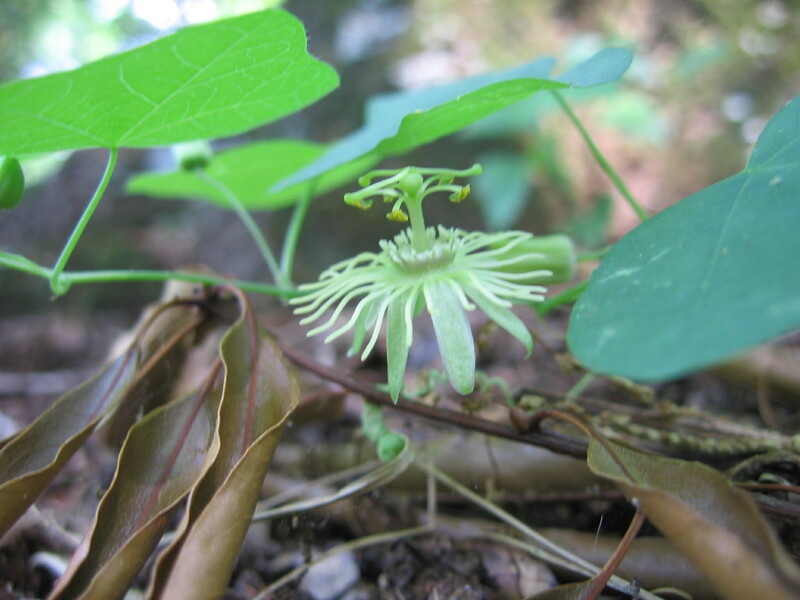 Yellow passionflower is listed as endangered in Pennsylvania, while the Southern Weed Science Society considers it weedy and potentially invasive. Is this huge discrepancy a case of beauty residing in the eye of the beholder? The University of Texas at Austin’s Ladybird Johnson Wildflower Center–Native Plant Database lists yellow passionflower as a major food source for several species of butterfly larvae, including the Julia Heliconican, Mexican & Gulf fritillaries butterflies, and Zebra & Crimson-patch long-wing butterflies. Passiflora lutea, yellow passionflower vine. The flower is named for symbolic imagery of Christ's crucifixion, called The Passion of Christ. 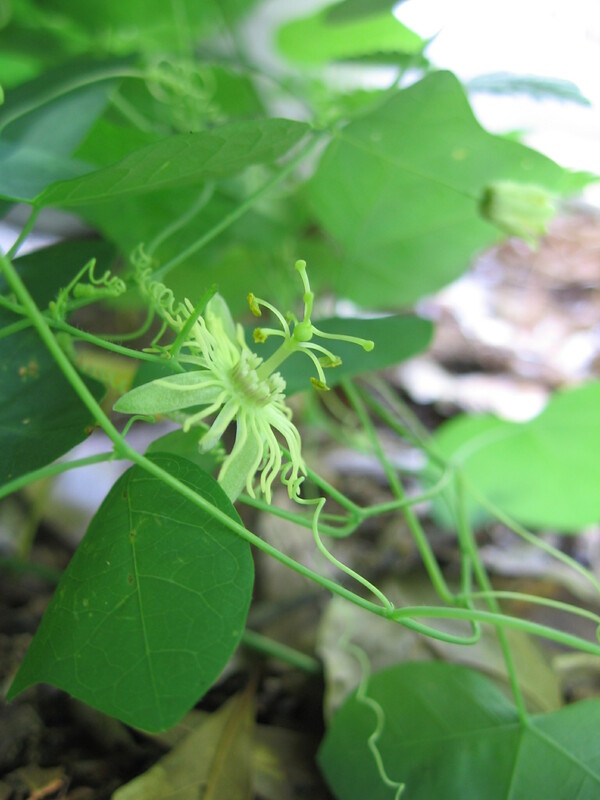 Medicinally, P. lutea will have some similar sedating nervine effects as Passiflora incarnata, or purple passionflower; however, it’s too uncommon to sustainably harvest. The fruits are edible, as are purple passionflower’s. If you are lucky enough to have this growing in your yard, let the fruits dry, collect the seeds, and start a P. lutea nursery. P.S. 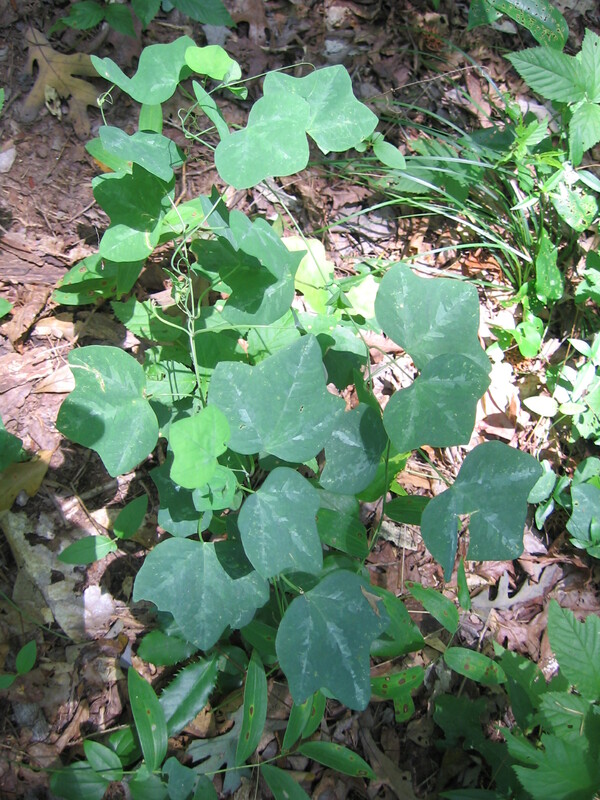 – I’ve also now seen a small vine of P. lutea near the banks of the North Oconee River on the greenway near Sandy Creek Nature Center in Athens, and on a wooded trail behind the UGA Intramural Fields. Passiflora lutea, yellow passionflower vine, hiding underneath the foliage. Variegated foliage of Passiflora lutea, yellow passionflower vine, on trail behind Intramural Fields at UGA, Athens, GA.
A beautiful vine, Passiflora lutea.